The Village Grill and Butcher is the newest addition to the Franschhoek Restaurant portfolio. This beautiful Franschhoek restaurant is located conveniently at the entrance to the Franschhoek Village. Our experienced team headed up by General Manager, Dominic Dear, is on hand to provide our patrons with a warm welcome and a superb meal. The Village Grill and Butcher also offers a thoughtfully selected wine list, walk-in butcher where you can choose your favourite cut of meat, as well as lush gardens and an outdoor kids play area. At the Village Grill you can sip on a cocktail in our well-appointed bat whilst you wait to be seated or you can simply enjoy a drink after a great meal. A unique addition to the Village Grill and Butcher is the in-house butchery where you can order a succulent piece of meat for your next braai or dinner party. 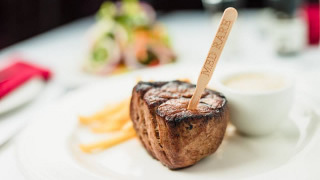 Our grass fed beef is already aged to perfection for your enjoyment. All our beef is locally sourced from farms in the Winelands area. The cows are raised as naturally as possible and not kept in feedlots or pens. All our beef is free from routine antibiotics and growth hormones. Our lamb is certified free-range Karoo meat of origin. They spend their time grazing in the veld in the greater Karoo area.